There is no denying to the fact that PHP is one of the programming languages which has emerged as the most powerful web development platform in a short span of time. It’s immense popularity can be cited from the fact that today it is installed on more than 2.1 million web servers worldwide and 244 million websites and web applications are running on it. And this is the reason that ever since PHP conquered the programming world, a whooping no. of frameworks arrived in the market with their own set of tools and functionalities to let developers complete their small or large projects better and faster. But before you dive into the PHP Development world, hit on a Project and get your hands dirty with the code, the first and the foremost question that is likely to haunt your minds is, which is the best framework to be chosen so as to relish the charm of designing a perfect application in a jiffy. I along with my team of PHP web development experts decided to unveil the best PHP frameworks and compile the list for all the programming nerds so that they don’t get stuck in the middle of the project struggling to make peace with the decision they took and repenting afterwards if it doesn’t meets the requirements. So here we go in the hierarchial order of their popularity ! !The numbers are given in accordance with the recent survey on PHP Frameworks conducted by Sitepoint. Request a Free Evaluation of Your Development Project by Experts. Laravel is currently the most popular PHP framework in the GitHub arsenal that offers an inherently promising foundation of well tested reliable code built on the top of several symfony components. You may be interested for What makes Laravel leads over other PHP Frameworks? Phalcon is a full stack web framework for PHP 5 that is written and implemented as a C extension. Phalcon basically aims at creating and maintaining highly configurable web applications that sync right with the enterprise development guidelines. Native namespaces so that you can differentiate between similar class names or controllers and create bundles or modules easily. Direct Injection that facilitates easy-to-create software which tests end to end applications. Symfony bags third position amongst all other PHP Frameworks. It is one of the most actively used framework that ships with a powerful ORM and excellent documentation. The frequency of its fast adoption can be cited from the fact that Drupal, the most popular Open source CMS framework worldwide uses the symfony components upto its latest version (Drupal 8). Extensible upto the brim and is presented as “Bundles” that are intended to add extra functionalities to the framework. Yii is a high performance feature rich framework that mainly lets you focus on the beautifulness of the code while doing all the grunge work completely behind the scenes. A lot of things in Yii happen automatically but still the learning curve is slightly steeper. Provides excellent support for writing and running both unit tests and functionality tests, which are prominently based on PHPUnit and Selenium. There is a detailed documentation for everything if you get stuck anywhere. May it be any single method or property, everything is clearly and systematically documented. Works fantastically well with 3rd party codes. It is designed in a way that you can even use codes from PEAR or ZEND framework into your Yii Web Application. Integrates best with both the relational and non relational databases. Codeigniter is a simple to learn micro-framework that comes bundled with unmatched flexibility and comprehensive documentation. CakePHP ranks fifth amongst all the open source web application frameworks that follows all the Model-View-Controller (MVC) approach and software design patterns. Zend is the one and only framework which is best suited for Enterprise Projects. No other framework can match upto its flexibility, scalability and robustness. However, this framework is not meant for Beginners and even Intermediates but it can be of benefit to only the niche which is absolutely expert in PHP Programming as well as Object Oriented Concepts. World class Cloud support on servers. No Cloud lock-in, get everything on your choice of clouds. Instant Online Debugging and PHP Unit testing tools to assist with codes and test case report. Well, in my opinion, it is very critical to take a wise decision while choosing the best framework because this is the one and only thing that can either make or break your web application. Don’t just go with whatever others are opting. Hire expert PHP Programmers or shell out time to carefully evaluate every framework according to your needs because it is more or less like choosing a dress wherein you first need to figure out your fitting size (requirements) and your pocket (project budget) as well. # Post is last updated on December, 2016. 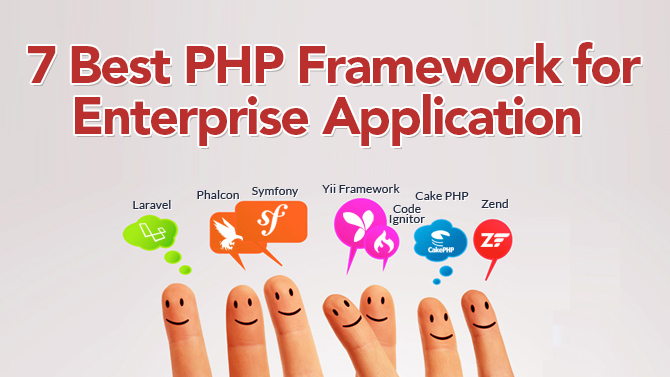 Which PHP Frameworks Are Best Suited for Developing Agile Software Applications?